Cogee’s St Brigid’s Parish slate roof installation used the Penrhyn Heather Blue slate from Welsh Slate. Built in an impressive Byzantine style in 1923, St Brigid’s Parish Church features a remarkable tower and beautiful marble alter. It was added to the National Trust Register in 1987. 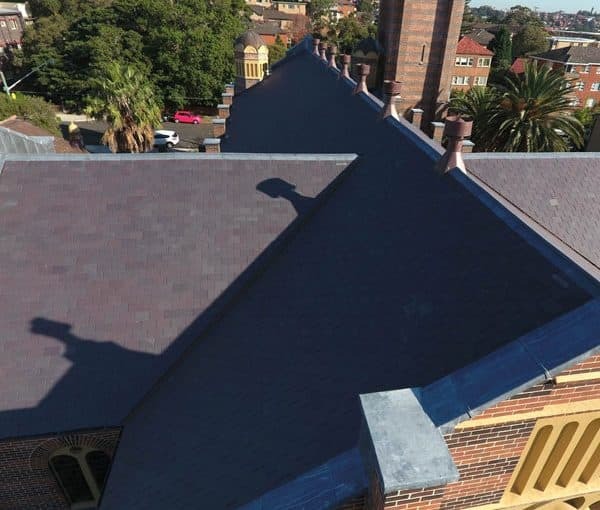 In 2016, Slate Roofing Australia restored the roof of the historic church, replacing the existing slate roof with Welsh Penrhyn Heather Blue slates. Our team of master slaters ensured the original ceiling was not compromised during the reroofing project and the church remained fully operational throughout the restoration. Particular items of significance include the face brickwork and cement render, stained glass internal plaster work and polished timber joinery. The brickwork, in particular, was a bold design statement by the original architect and is unique in Sydney. The roof contained asbestos which required removal. An asbestos contractor was engaged to work alongside SRA with air monitors on the ground to ensure surrounding areas did not get contaminated while keeping the building weather proof. The Slate Roofing Australia team ensured the original hung ceiling was not compromised and that the church remained fully operational during the reroofing project.